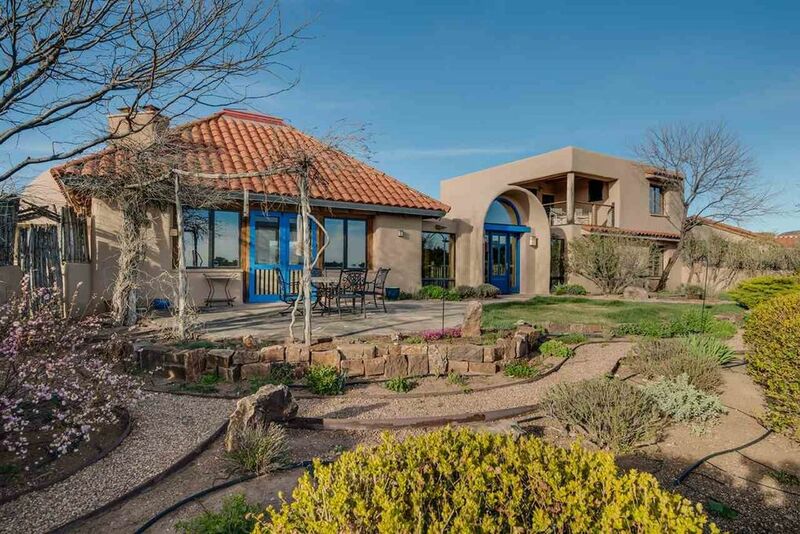 Located on 8 acres in Arroyo Hondo, Santa Fe's premier equestrian community, this spacious, beautiful three bedroom plus study home features stylish open living, dining and entertaining spaces. Three downstairs patios and an upstairs deck look out to dramatic views of the Sandia, Jemez and Ortiz Mountains. Additional features include a temperature controlled wine room, soaring ceilings in the living, dining and kitchen areas, a large country style kitchen and an irrigated, landscaped front courtyard. Plentiful windows and skylights contribute to the light and bright ambience. Home has direct access to the Arroyo Hondo trail system, a private neighborhood network of trails for hiking, biking and horseback riding which extends for miles. The property is quiet and private, yet the downtown Santa Fe plaza is just 8 miles away.